When I was young, my friend Mike excelled at things that everyone else did marginally well. Like Hacky Sack, that little ball you’d kick once or twice before it went careening through the air. Mike was like a magician with that thing. Ditto juggling, Yo-yo tricks, all the stuff I thought was cool. Today, I feel like Mike every time I use plastic wrap and while completing other assorted hacks around the house. I’m a calm guy normally, but using plastic wrap can make me homicidal. “We can put a man on the moon,” I’d say, waving the box around as if it were the very worst thing on the planet, “but we can’t design a usable box of plastic wrap.” You know the drill: draw out a length of plastic and the whole roll leaves the box, either as you’re pulling or when you attempt to tear it off. A careful inspection of the box reveals the hidden solution. On each end of the long box, you’ll find a little perforated tab. These are the lock tabs. Push each one into the box, punching out the perforated edges, and they lock the roll into place. It’ll never leap out of the box again. Take a look at this amazing chart from the American Cleaning Institute. This thorough guide to fabric care symbols has helped me immensely. Many of the little icons convey their meaning instantly, but what the heck is a square surrounding a circle with three dots in the middle? Or a square with three black lines? I want to clean my shirt, not decipher cryptic code. Print that out, laminate it if you wish, and hang it up near you laundry station. “I learned to tie my shoes when I was a kid. I know what I’m doing.” Well, maybe. A poltergeist is a “noisy ghost,” known for tossing objects around a room and making a general mess. But what about the ghost who likes to randomly flush the toilet? The issue of a spontaneously flushing toilet isn’t supernatural in origin. What’s likely happening is that water is leaking from the tank into the bowl. When it reaches a certain level, the toilet flushes. You can fix this by replacing a part called the flapper for about five bucks. This last tip was as mind-blowing for me as the plastic wrap thing. For years, I “folded” a fitted bed sheet by crumpling it into a ball and then shoving it in a drawer, where no one could see that I had crumpled it into a ball. Turns out, that’s not the prettiest way to do it. This great tip from Jill Cooper at Living on a Dime is perfect. Not only will you save storage space with a properly folded sheet, you’ll have an easier time finding the sheet you need. Regarding the fitting sheet, that works with older fitted sheets. Newer sheets are elasticized on all edges and it is not as easy to fold with this method. These are awesome – especially the plastic wrap idea. Ugh so frustrating. 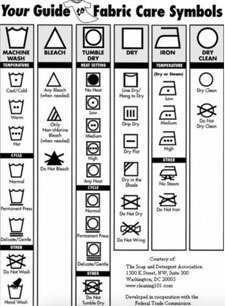 The link for the laundry icon just went to the general site- I searched but could not find the chart you reproduced. Can you make a link directly to that chart? Thanks. Not all toilets use flappers… but flappers break more often than siphons, so if your toilet’s flushing itself, it’s probably a crappy flapper. To really save time, fit a siphon instead – some countries call them “valveless”. I switched from fitted to flat for bottom sheets some years ago, only because the elastic got stretched out so quickly or so hopelessly that I just gave up on them. : ( But yeah folding them was always a pain! We don’t fold sheets – we just stuff them into their matching pillowcases. I started tying my shoes the way the guy in the video does it. Unbelievably fast! And thanks for the tip on the plastic wrap – I never noticed it before. I’ll go try it right now. Maybe it’ll save me some aggravation!